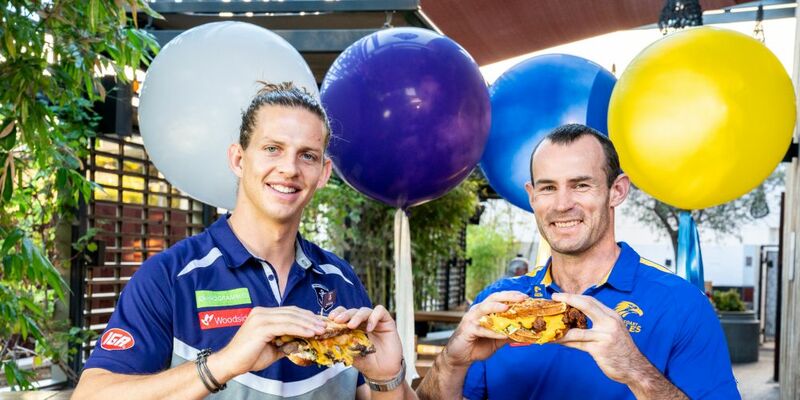 Fremantle captain Nat Fyfe and West Coast counterpart Shannon Hurn take their rivalry off the field in the battle of the sanga. 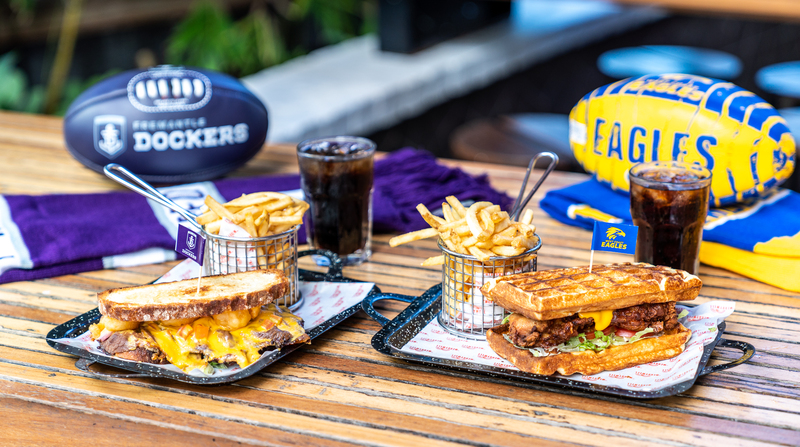 THEY’RE rivals on the field and from Sunday Fremantle Dockers and West Coast Eagles fans will be able to turn the rivalry into a food fight as part of The Merrywell’s new battle of the footy-themed sangas . Kicking off from the first Western Derby at Optus Stadium on Sunday Freo fans will be able to tuck into a ‘Freo Surf n Turf Sanga’ – popcorn prawns, mouth-watering roast beef, cheddar hi-melt cheese and a punchy remoulade sauce – all served up with lettuce, tomato, onion and pickles on crunchy toasted sourdough. While West Coast fans can opt for the ‘Eagles Big Bird Sanga’, filled with buttermilk fried chicken, oozy cheese sauce – in true honour of the golden team colours – topped with coleslaw ranch, lettuce and tomato between crispy waffles. For every combo sold $5 will go to each club’s chosen charity. Freo will support Ronald McDonald House Charities, an organisation that helps seriously ill children and their families, while West Coast will support Telethon. Battle of the sanga – Freo v West Coast. Crown Perth’s food, beverage and entertainment chief operating officer Andrew Hill said the derby provided the perfect opportunity to indulge your team pride in a “sanga” for a good cause. “West Australians love their footy but their passion also runs deep when it comes to giving,” he said. As for which sanga Hil thinks will win, he said he was happy to sit on the fence.